Gia also has to deal with everyday matters like running for class president and being featured in Vogue! Yet she juggles it all using her awesome connections and friends. 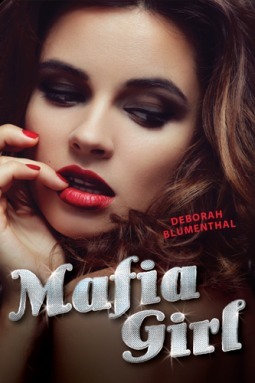 I don't know if you can tell from the summary of the book that I wrote, but my thoughts on Mafia Girl are not all that positive. I picked this up hoping it was going to be a light, fun read, maybe even something that could pull me out of my reading slump. Instead I got a book where I was forced to reread passages in order to understand what the heck was going on. There were several times when Gia was doing something and then BOOM something completely different was happening at a different place and I didn't even realize the setting changed. So then I would go back and reread the passsage two or three times trying to make sense of it all. So when he grabs my hand, I follow him into the laundry room. Ten. Nine. Eight. Seven. Six. Five. Four. Three. Two. One. The door to my room flings open and me dad x-rays me so hard I can practically feel the burn. Another thing about this book that I hated was Gia 's need to label every single person in the entire school with some type of derogatory term. Basically in Gia's perfect the world, EVERYTHING revolves around her. Her friends think she is so amazing! When she first tells them about running for class president the response she gets is is immediate. The tell her how freaking amazing she is and how she will win. Which I mean is cool and everthing, except for the fact that she's a absolute jerk towards the entire school. How could you possibly win with that kind of reputation? I would also like to point out that Gia is a stalker. After being puller over by a cop, who she refers to as Officer Hottie, she proceeds to have her friends hack things in order to find out where he lives, where he goes when he's off work, and even his entire back story. Because ya know, that's not creepy at all!!! It's been one week, sixteen hours, and thirty seven minutes or so since I've last seen Michael. I check my phone every time I inhale to see if he might have broken down and called. So after he still hasn't called her she finds him again, where she once again completely freaks both him and the reader out. I wake up at night thinking about you, Michael. Mafia Girl had potential, yet I found it to be lacking in so many aspects. The characters were weak and the plot was basically about Gia and Michael's epic romance. There were other events (like Vogue and the school election along the way) but in the big picture it didn't really matter. I really wish that before picking up the book I had read reviews for it so that I wasn't so surprised. Mafia Girl just wasn't the book for me.